The morning glow of a summer sun sizzles on the Indiana horizon, growing in intensity until the sun itself boils forth from the ground and rises, spreading it’s rays over the state. It’s already hot, however, at a steel mill, where it’s twin pair of basic oxygen furnaces have been raging with the sun’s same intensity all night. The enormous two-story, pot-bellied vessels alternately tip sideways and straighten, fed by chunks of solid steel scrap washed down with deep swigs of molten iron. Every 45 minutes, each furnace produces as much as 300 tons of molten steel. is the result of a $50 billion investment made by the North American steel industry in advanced technologies that make the world’s strongest, most innovative material even stronger and more innovative - and all at a lower cost to the consumer. together to form the Steel Alliance. The steel industry has emerged from the past two decades a leaner and more efficient industry than ever before. Thanks to advances in technology, no other country produces more steel per man-hour than the United States. In addition, the United States is the planet’s lowest cost steel producer. 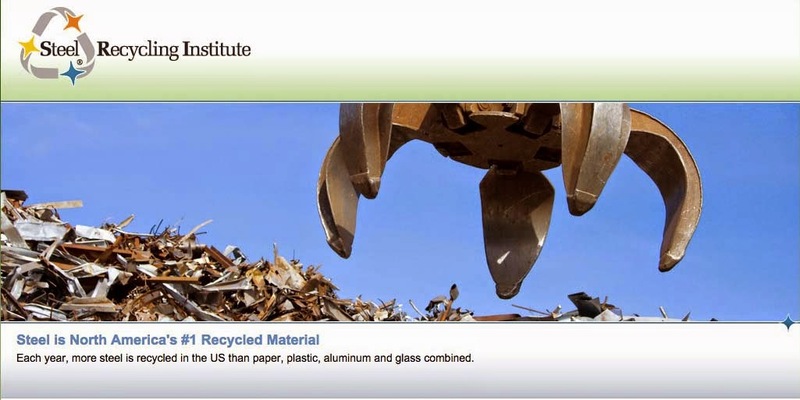 The North American steel industry has also collectively cut emissions, increased the recycling of post-consumer steel products from the solid waste stream and reduced the amount of energy needed to make steel. All these positive attributes of steel have something in common: the public, for the most part, is largely unaware of them. David Hoag, the chairman of TheSteelAlliance and chairman and CEO of LTV Steel Corporation, agrees. Arming consumers with the facts about steel has begun through a five-year, high profile awareness campaign entitled “The New Steel. Feel the Strength.” The campaign reaches out to the millions of people who buy automobiles, appliances, houses, canned food or any of the many products made of with steel to help them recognize steel’s attributes. And with an audience of millions, the campaign is sure to keep Stephenson busy in the years ahead. The infrastructure of the computerized age has crept into all areas of our lives, and the steel industry is no exception. From behind the glass of climate-controlled “pulpits” that overlook the steelmaking line, engineers monitor computer screens that flicker with data about the hot slabs of new steel rolling past. Computers working in concert with the latest technology in responsive steelmaking machinery ensure that steel is made to precise dimensions and worldclass quality. Steel’s biggest strength has long been its flexibility-meaning its ability to adapt to change and meet increasingly stricter performance demands. Metallurgists and engineers in the North American steel industry work with these new technologies to produce ever stronger, lighter, thinner steels. For example, the Sears Tower, the world’s tallest building when it was constructed in 1974, could be built with 35 percent less steel today. Make the steel manufacturing process cleaner: an initiative that the steel industry has backed with a multi=-billion dollar investment. Over the past decade, the industry has invested approximately $10 billion to reduce steelmaking’s impact on the environment, especially in regards to air and water emissions. Advanced air pollution control devices have been installed in steel mills that capture dust particles and gases. Today, the industry has collectively reduced carbon dioxide emissions by 28 percent and waste water emissions by 91 percent compared to ten years ago. Annual energy consumption has been cut by more than 30 percent in the same time period. The North American steel industry has worked in partnership with automobile manufacturers to engineer and manufacture automotive components that are much lighter and stronger than was thought possible less than a decade ago. This partnership has led to new vehicle designs and construction techniques that have meant a 20 percent decrease in vehicle weight since 1978.
on a project called the UltraLight Steel AutoBody, which combines cutting edge automotive design with the newest state-of-the-art manufacturing techniques to enable the world’s automakers to produce a new family of safe, light-weight, low cost, fuel-efficient car bodies. Steel built our skyscrapers and bridges. And now, environmental and economic concerns motivate the building industry to examine alternative materials and methods in residential construction. An exciting new market has been found in steel homes. The new steel resists decay, corrosion, fire and floods more than any other material, which is why it is now being used more in residential construction. The New Steel. Feel the Strength. Nearly 150 years ago, steel sparked the industrial revolution. Today, it’s still revolutionizing the way we live and shaping our future.